His sponge didn’t stop the thousands of teeth of a great white. Very sad. Needless to say, the loss is very, very sad. MSNBC provides a full report on the incident. 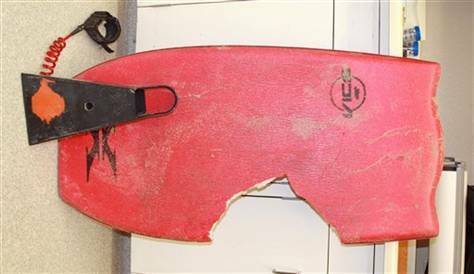 The Central Coast seems to be a magnet for great white shark attacks. There has been a lot of speculation that the great whites follow the cold currents for food. As it turns out, the cold California Current slams into the beach in this area, just north of Point Conception. So, this area of the coast is ground zero. Here is a map of the area. 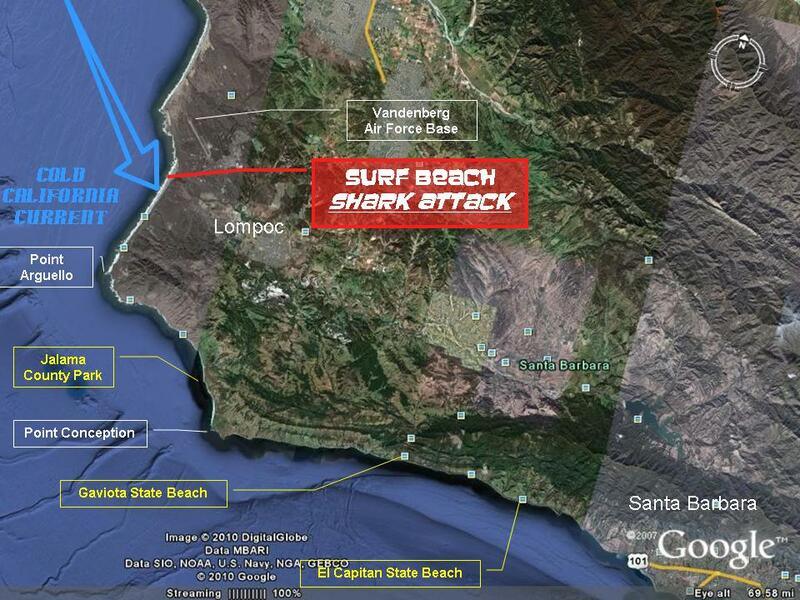 The incident occurred just north of Point Arguello, at Surf Beach, on Vandenberg Air Force Base. The only time I’ve personally seen a great white was when I was surfing in the bay between Jalama County Park and the Point Conception lighthouse. The water is shallow, so we were about 100 yards out in the water. Suddenly, a large dorsal fin started tracking horizontally across the water surface about 20 yards away. My buddy and I raced to see who could get to the beach the fastest. With that said, did you know we have had our own shark sightings at Uppers over the last few months? Tom O’Hara was manning the indicator position on the point [his usual position]. It was early morning and he was daydreaming as he waited for the next set. He saw a grebe (bird) nearby and was coincidentally wondering if they ever serve as shark bait. Within just a couple minutes, he looked over at the grebe again and saw a large shark’s nose break the surface and nudge the grebe. Then, after dropping back under water, the shark popped up again and nudged the grebe from the other side, as though it was trying to see if the grebe was alive. The funny thing is that the grebe just sat there, still and calm. Within a few seconds, Tom paddled to shore, followed by the rest of the crew, all of them passing the word as to what was going on. They all stood on the rocks together, trying to make another sighting to confirm what they thought they had seen. Over the next few weeks, there were other reports of shark sightings, probably the same shark. It was about an 8 to 10-footer. Tom said a shark expert friend told him it was likely a juvenile great white, based on its shape and behavior. So, be careful out there. Try not to bark like a seal. You already look like one. And, you know the favorite meal for a great white — that’s right, penipeds, including seals.